It is no secret that the grappling aspect of mixed martial arts has been Kevin Belingon’s Achilles' heel as three of his five career setbacks have come by way of submission. Belingon had a difficult time in dealing with elite submission specialists such has Bibiano Fernandes, Dae Hwan Kim and Masakazu Imanari inside the ONE Championship cage. 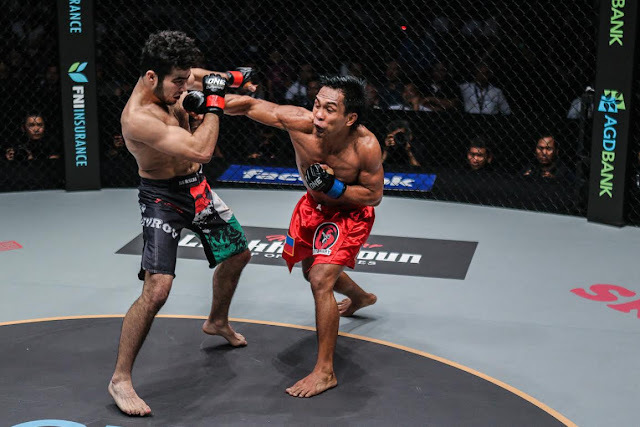 Following his first-round submission loss to Fernandes for the ONE Bantamweight World Championship belt in January 2016, it forced Belingon to take a nine-month hiatus to extensively work on his ground game. In his most recent outing, Belingon managed to pick up a lopsided win over Tajik standout Muin Gafurov, who is well-versed in both stand-up and grappling departments of the sport. The 28-year-old Baguio City native shied away from his relentless fighting style and resorted to a more tactical approach to get a unanimous decision against Gafurov. From bell to bell, Belingon banked on his lashing leg kicks and takedown defense to keep Gafurov at bay. Belingon continued to dictate the pace of the match in the third and final frame, where he maintained his distance by consistently telegraphing his leg kicks while making Gafurov hesitate to cut the gap with his signature left hook. “Gafurov has a knockout power. I had to be careful. In a match with a fighter like him, you have to be one step ahead of him while being cautious. One mistake could cause me the match,” Belingon shared about his meeting with Gafurov this past October. Belingon will once again share the ONE Championship stage with a feared grappling expert as he is set to square off with Finnish fighter Toni “Dynamite” Tauru. Both men are booked to face each other on the undercard of ONE: KINGS OF DESTINY, which takes place at the 20,000-seater SM Mall of Asia Arena in Manila, Philippines on 21 April. Eight of Tauru’s 11 pro wins have come by way of submission. Belingon’s teammate Geje Eustaquio fell into the hands of Tauru last December via first-round rear-naked choke. With his highly-improved wrestling and grappling arsenal, Belingon is not worried if he has to enter the submission wheelhouse of Tauru as the 5-foot-4 Team Lakay standout is confident that he could match his Finnish foe’s grappling arsenal. “Toni Tauru is world-class athlete. He is no pushover. I know that he has a high-caliber ground game, but I believe I can cope up with his grappling. In my last fight, I wasn’t able to fully show my capabilities on the ground,” he asserted. “It’s fine with me whether it will be standing up or exchanging positions on the ground. I can fight anywhere,” Belingon quipped. However, Belingon believes that fighting within his comfort zone will give him a better chance of walking out with his hand raised. “Striking is my bread and butter. If he wants to trade strikes, I will be happy to exchange strikes with him,” he stated.